We are quickly becoming big Dinosaur Train fans in my house. For years, Mason's older cousin is into dinosaurs of all kinds, shapes, and sizes. Now when he comes over to visit with Mason, they will sit together and watch Dinosaur Train. Seeing this happening, I was very excited to have the opportunity to review, Pressman's new Dinosaur Train All Aboard Game . Right off, the packaging is eye catching! You have the bright and colorful character of Dinosaur Train right on the cover! The game board and playing pieces are just as attractive. The greens, blues, and yellows used to create the landscape and train tracks are very inviting. It makes you want to jump on in and get the game started! To start off, you have to choose a familiar character from the show - Buddy, Tiny, Shiny, Don, Cory, Tank, or Mr. Conductor. The object of the game is to move along the tracks through the three dinosaur eras, Triassic, Jurassic, and Cretaceous. You win the game by advancing closer to and being the first player to reach the nest. Mr. Conductor tells you how many spaced to move.. There are also "Stopwatch" spaces that let you move closer to the nest and "Dinosaur Crossing" spaces that send you backwards. The first player to reach the nest wins! 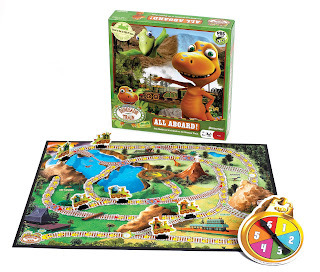 The Dinosaur Train All Aboard game is a great game that the whole family can enjoy. It is age appropriate for the 4 and up crowd and it engages children to continue practicing numbers, counting skills, and critical thinking skills. If you are already a fan of Dinosaur Train, you will easily see how this game brings the educational aspects of the show to the game. This game is recommended for ages 4 and up and is for 2-6 players. It includes the game board, pocket watch spinner, 7 movers, 6 stand movers, and the rules of the game. It retails for about $12.00. "Dinosaur Train embraces and celebrates the fascination that pre-schoolers have with both dinosaurs and trains. This top-rated, award-winning series, which airs on PBS KIDS, encourages basic scientific thinking skills as the audience learns about life science, natural history, and paleontology. The stars of Dinosaur Train are Buddy, and adorable preschool age Tyrannosaurus Rex, and his adoptive Pteranodon family who board the Dinosaur Train to embark on adventures to prehistoric jungles, swamps, volcanoes, and oceans. Paleontologist, Dr. Scott Sampson, is also featured." 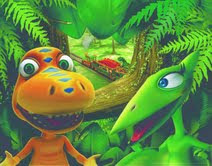 Check out more about Dinosaur Train at www.pbskids.org/dinosaurtrain. You will find additional learning resources for parents and teachers like activities, games, videos, and more. Congratulations to Danielle M! The winner will be notified by email and will have 48 hours to respond. If no response is received within 48 hours, an alternate winner will be chosen. There are four things you can do to earn an entry. Please fill out the form for EACH entry, including each bonus entry. You may enter once per day, including multiple entries. Multiple entries other than daily entries will be deleted. This Giveaway will run from 12:30pm on 11/8/10 to 12:30pm on 11/15/10. Jim Henson and Pressman Toys provided me with the product reviewed above in order to facilitate this review. All opinions are 100% mine. Growing up, Advent Calendars were always a big deal in my house. Every year we would buy an Advent Calendar in anticipation of the Christmas season. I had to take turns with my sister opening the numbered doors and I could only imagine what waited to be uncovered! Would it be a sparkly picture or a real treat, like a piece of chocolate, waiting for me behind the little paper door? This is definitely a tradition I will carry on in my family for Mason and Playmobil is helping to make that happen. Introducing Playmobil's new Pony Ranch Advent Calendar for your Advent Calendar adventure this holiday season. This Pony Ranch Advent Calendar will bring smiles to both girls and boys alike as it helps to countdown the days until Christmas. Like a traditional Advent Calendar, it contains 24 surprise items, one for each day of Advent. Included is also a pony ranch backdrop so you can create the pony ranch scene as the figures are unveiled from the box. The Pony Ranch Advent Calendar also features a pull out windows that hold the Playmobil figures. Other accessories included in this play set are three figures, horse, ponies, donkey, mule, stable equipment, and pony stalls, just to name a few. What is particularly nice about this play set is when the holidays are over, it can remain out for year-round fun! The Advent Calendar Pony Ranch is recommended for ages 4 and up. It retails for $18.99. Make sure you get yours today so you have time to create a new tradition or keep and old one going. For more information, don't forget to check out http://www.playmobil.com/index.html. Playmobil provided me with the item above in order to facilitate this review. All opinions are 100% mine.